It’s here! It’s here! It’s publication day!!!! Can somebody hand me a large glass of wine, please? I mean, my nerves are in knots and my palms are super sweaty, but IT. IS. HERE! 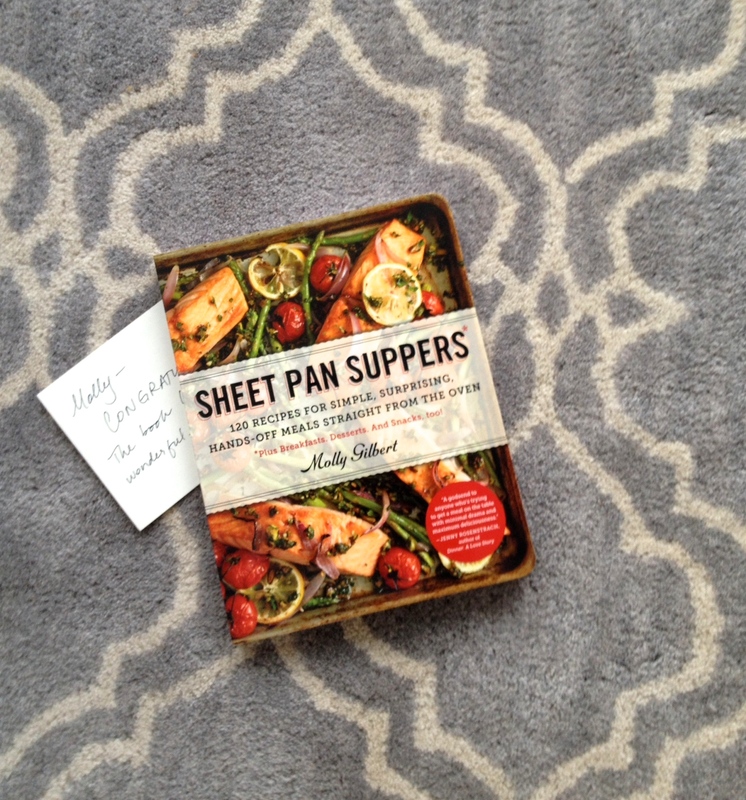 Sheet Pan Suppers. Two years of work, in cookbook form! Is anyone else freaking out a little bit? 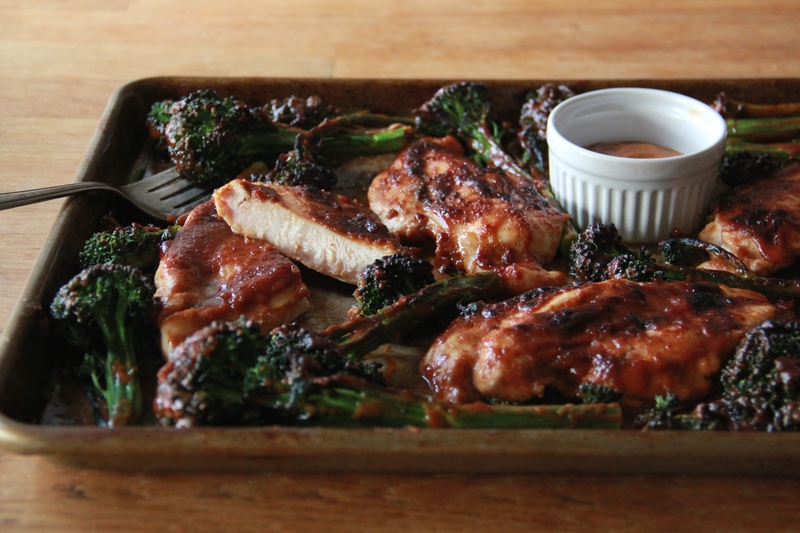 In honor of publication day, I thought I’d share one of my favorite weeknight recipes from the book – this Quick Chicken & Baby Broccoli with Spicy Peanut Sauce! Peanut sauce (or peanut “snauce,” if you’re my sister) should be it’s own food group, as far as I’m concerned. This one is sweet and tangy and spicy, and you could probably get me to eat an old boot if it were covered in enough of the stuff. As it is, we’ll thickly slather it on thinly sliced chicken breasts and tender broccolini, and the whole thing will cook — you guessed it — on a SHEET PAN, under the broiler, in about twelve minutes! Thanks for your support, friends! You rule. #sheetpansuppers! Preheat the oven to broil, with a rack 4 inches from the heat. Line a sheet pan with aluminum foil or mist it with cooking spray. Whisk together the brown sugar, peanut butter, sesame oil, soy sauce, sriracha, vinegar, water, and lime juice in a medium-size bowl until smooth. Set aside . cup of the peanut sauce for serving. 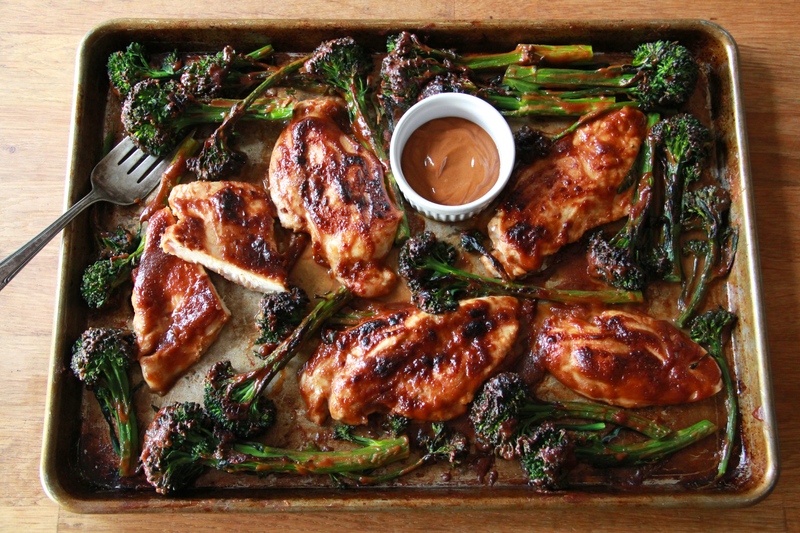 Rub the broccolini and chicken with the remaining peanut sauce to thickly coat, and arrange them in a tight single layer on the prepared pan. Broil, keeping a close eye on the pan to prevent burning, and flipping the chicken halfway through, until the chicken is just cooked through, the broccolini is well charred, and the sauce is bubbly and deeply browned, 10 to 12 minutes. 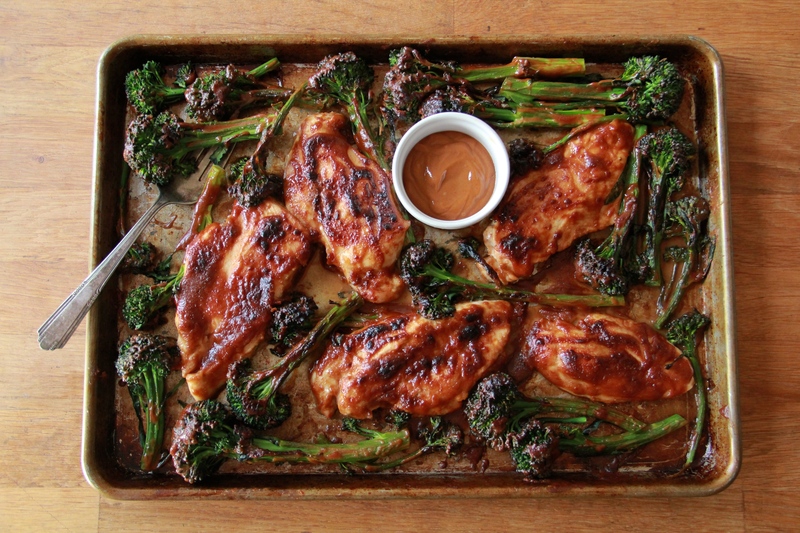 Serve the chicken and broccolini hot from the oven with the reserved dipping sauce alongside. Congrats Molly! What a huge accomplishment. I’ll be ordering my copy today and can’t wait to try all of your tasty creations! Thanks so much Kristen! You’re the best!! Congrats!! Received my book the other night and it’s beautiful. Can’t wait to get cooking from it! Awesome Molly!!! The book is the best – absolutely amazing!!! Yay and congrats!!! A great accomplishment Molly. Lots of meaty ( no pun intended) stuff in this book. Chock full of great recipes and stories and tidbits to boot. Love it! Congratulations! I was poking around Amazon and came across your cookbook which led me to your blog. Both are Wonderful! I just finished ordering your book and now on my way to Trader Joe’s to get the ingredients for your Chicken and Baby Broccoli with peanut sauce recipe. Can’t wait! Thank you and wishing you the Best! Wow, thank you Jackie! So glad you’re here! Glad to have found it and your blog as well! Thank you so much, Liz! Glad you found me! The Houston Chronicle ran an article about your book this morning! Came right home & ordered it to give to my daughter who doesn’t cook in hopes of turning her into a one pan cook. Fingers crossed! Bought one for myself too. Great reviews so far online. Congrats & glad to find your blog! Hi Molly- just got your book as a gift from my book club friend who is an amazing cook. I love the way you write and cannot wait to try your recipes. What an accomplishment. Congrats! And btw- giving it as gifts to my daughters! Thanks so much, Lisa! I hope you love it!! I just ordered on Amazon – they were all out and put me on a wait list but I should be getting it soon. Cannot wait to receive this book in the mail. Merry Christmas to me :). Ebay has them – I ordered one this week. I’m making the Chicken and Broccoli tonight. YUM-O!!! I’m ordering your book ASAP!! Very excited to try more of your recipes!! Thank you!! ahh, thanks Vanessa! So glad you enjoyed! Hooray! For such a lovely note. Thank you!! This recipe is OUT OF THIS WORLD!!!! So simple and absolutely wonderful, can’t say enough about it and I’m ordering your book now based on this recipe (which I found in PARADE Magazine). You are quite a secret genius (at least right now). Thanks Molly! This was SO delicious and the perfect weeknight dinner! My husband and I both loved it. I’m so excited to try this recipe but my broiler is broken… can I just roast instead? At what temperature? I’ve only used the broiler for this one but if you roast, I’d say try at 375 and keep a close eye on everything – it will cook quickly (and you don’t want the chicken to dry out…). Good luck! We made this tonight (super quick and easy to make) and it was off the CHARTS delicious. Can’t wait to try more of your recipes! !